Just when we thought the Omega NC800 couldn't look any better, Omega brings to you the Omega Juicer NC900HDC - the chrome sibling of the latest matiscating juicer from Omega! The new Omega NC900HDC Nutrition Center from Omega leverages its experience from the 8003, 8004, 8005, and 8006 models to bring you this beautiful new design. 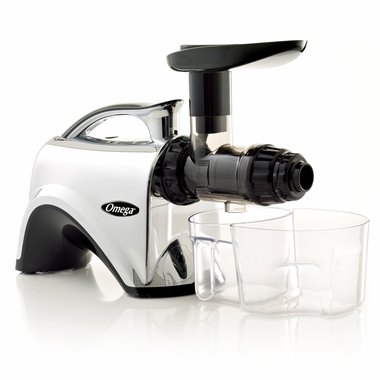 The Omega Juicer NC900HDC is equally featured and functional as the 8004 and 8006 models. Of course they've included the 8 times stronger Ultem auger and screen. Omega has also built the handle into the design so moving the juicer as needed is a breeze! The operating RPM of 75-85 ensures that its slow juicing process offers some of the highest yields among all single gear / auger masticating juicers. Included is both the juicing screen for typical juicing, and one for soft fruit and more. The 1/3 HP whisper quiet motor includes a built in reverse feature to minimize clogging. The Omega NC900HDC still continues to be your all-in-one multifunction nutrition center. It does vegetables (like carrots, beets, celery, peppers, and radishes), leafy greens and wheatgrass (Wheatgrass, kale, chard, cabbage, spinach, and pine tree needles), and Fruits (even citrus) without a challenge. The Omega Juicer NC900HDC will even mince ginger and chop garlic, red pepper, scallions and most other foods, including herbs and seasonings. Works also as a homogenizer so you can make your favorite sorbets, baby foods, and nut butters. With the included pasta nozzles it can even make pasta! The most versatile of juicers, and I've tried them all. It does everything well, carrots as well as wheatgrass, is easy to clean and operate. A real pleasure to use every day. I am very happy with this juicer. I recently watched a movie with Joe Cross where he juiced for 60 days to become more healthy. I did a lot of research as to what juicer I wanted to but. I immediately knew that I didn't want a centrifugal juicer and leaned toward a masticating juicer. This one takes the cake. It's easy to use, easy to clean...it's versatile. The pulp that's left behind is almost bone dry. I think the only way you could improve on it is by buying a dual gear juicer...which double the price for a cheap model and run upwards of $3k. I'm very happy with it and I highly recommend. I love this juicer, easy to work with, easy to clean and the juice is without foam. So far we\'re satisfied with the juicer but would like some recipes. In the fall we\'re planning to run apples through it for juice/cider. The thing I would like to see is a taller lip on the feeder for dark leafy greens and a bigger throut feeder. But it works great as is. Great value for the price and I love how easy to clean it is. I highly recommend it. For the price range, this is an excellent juicer. Thanks fro quick shipping and excellent packaging. I have been extremely pleased with my Omega NC900HDC Juicer. The large opening for the feed chute makes it very easy to load bulky vegetables. I've juiced many things from thin wheatgrass to bulky beets and it's done a great job. I usually run things through multiple times to maximize the juice extraction. Afterward, the pulp is just barely damp. The auger is strong and easily presses out a lot of juice. Even though it has a reverse mode, I haven't needed it. Nothing has ever gotten stuck. The assembly and cleanup are so easy and quick. The large, topside handle makes for easy, one-handed carrying. I LOVE my Omega NC900HDC juicer! This juicer is one of the best! Because of the motion of the auger, it keeps the most nutrition in your fruits and veggies. I've experimented with many different types of produce and this juicer does it all! It is especially perfect with wheat grass and leafy greens. I highly recommend this juicer to anyone who is looking to get more nutrition into their diets. Lastly, I researched this juicer on many different sites, and Harvest Essentials had the lowest price as well as fastest shipping. Their customer service team was incredibly helpful and kind. I've had a few juicers before, but this Omega NC900 is by far the best one I've ever used. Being a health coach, I have taught many people about making juices and I never hesitate to recommend that they spend the money to get this one. It's also really easy to clean, a huge bonus. I compared this juicer with others online, of the same brand, and harvest essentials had by far the best price, $100 cheaper than the omega website itself. Im completely happy with my juicer (NC900), it juices vegetables amazingly. I'll admit it could juice fruit a little better, but I mainly bought it for juicing veg. My only concern is that by buying this juicer you may get carotenemia, I've litterally had 10lbs of carrots with in a week. Needless to say, I'm extremely satisfied with my purchase. Great juicer, and a great price from this company. Harvest Essentials not only offered this Omega juicer at the best price I could find, but shipped it free. So far, the juicer has done everything Omega claims, and it has replaced our Champion juicer.